New for August 2007! This page will serve as the main page for different ideas on line stretchers. There are as many types of line stretchers as there are transmission lines. Lien stretchers are often called trombones, because they accomplish the same purpose, except that the wave that is being delayed is electromagnetic, not audio. Phase stretchers generally use 50 ohm transmission line modified so that its length can be changed. By lengthening it, more phase is introduced. Note that the phase shift is proportional to frequency (often "ideal" phase shifters try to provide a fixed phase shift with frequency. The phase shift of a line stretcher could be described as "true time delay". Phase stretchers usually provide response down to DC. 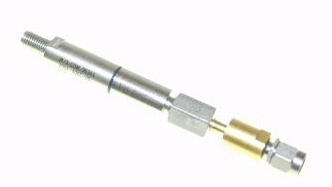 Here's an image of an Omni Spectra coaxial line stretcher that covers DC to 18 GHz.